Ecstatic Alphabets, Heaps of Language – Art – Domus. It is apropos to our unease, excitement or dismay about the digital metamorphosis of the book. As Sachs puts it, “The historical works here swing between anxiety and ambivalence, emotions seemingly inevitable in response to the immense power (and attendent limitations) of written communication.” The same is true of our reaction to the moiling of books, ebooks and apps. And the MoMA exhibition is one of those “full circle” phenomena, a recapitulation, a reminder of how, in trying to ground the history or evolution of the book, in reading its situation, we often go right back to the alphabet, the word, language itself. Of David Diringer‘s two substantial volumes on the history of the book, the first is entitled The Alphabet (1968). In Helmut Lehmann-Haupt’s brief but important One Hundred Books about Bookmaking (1949), an entire section is given to writing and lettering, and that is preceded by a bibliographical entry for Edward Chiera‘s They Wrote on Clay (1938), on how the tablets of the Babylonians still speak to us today. For another instance, see also the posting here on Norma Levarie‘s The Art & History of Books (1968). 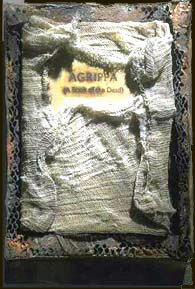 James J. Hodge, “The Agrippa Files, an online archive of Agrippa (A Book of the Dead).